Beautiful personalised silky cushion featuring pretty light and dark mauve coloured embroidered Alabaster flowers and your customised text to commemorate a special occasion. 41cm or 16 inch square polyester cushion with ivory coloured background and pretty little flowers encircling the personalised embroidery in romantic fancy script. 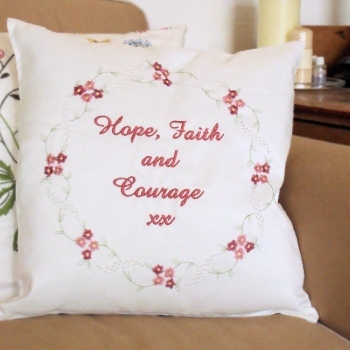 Embroidered with your choice of text and is a wonderful keepsake gift to commemorate a wedding, anniversary, birthday, holiday or even a special message!